View More In Cord Management. High Quality Cable Ties and Cinch Straps for Home, Recreation, and Work. TIEGO Cinch Straps with Buckle and Cable Ties 20-Pack has combined the most convenient sizes of reusable, adjustable hook & loop cable ties and cinch straps. Bundle up and secure just about anything with these hook and loop straps. Amazon buyers trust TIEGO Cinch Straps and Cable Ties for their Premium Quality hook and loop material and workmanship. You are backed by Our 100% Lifetime Warranty! Click the Button "Add To Cart" at the Top of This Page Right Now to try our product at ABSOLUTELY NO RISK! 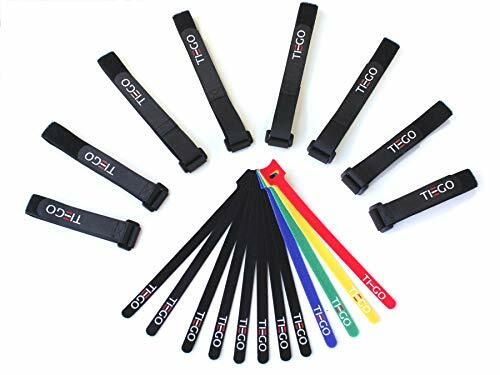 20-PACK MIX STRAPS AND CABLE TIES, MOST POPULAR 5 SIZES: pack includes (2) 24 inch x 1.5 inch, (2) 22 inch x 1 inch, (2) 18 inch x 1 inch, (2) 15 inch x 1 inch reusable hook and loop cinch straps with buckle and (12) 9 inch x 0.5 inch self adhesive cable ties. DURABLE STRAPS, PREMIUM QUALITY WORKMANSHIP: TIEGO cinch straps are made with high quality 100% Nylon material. The hook and loop straps are securely attached with double stitching, not plastic welds. CONVENIENT AND REUSABLE STRAPS: Cinch straps with buckle are the best choice when needing to secure large bundles due to their simplicity, strength and versatility. TIEGO hook and loop straps are perfect for securing sports equipment while traveling, bundling tubing, cables, new construction material or fiber optic bundles. GREAT ALTERNATIVE TO ZIP TIES: Buckle cinch straps are adjustable and don't pinch. TIEGO ties bend and hold strong in various situations and leave no scratch and scuff. LIFETIME WARRANTY AND 100% MONEY BACK GUARANTY: If you are not 100% completely satisfied with your purchase, just let us know and we will issue a full refund or replacement. If you have any questions about this product by TIEGO, contact us by completing and submitting the form below. If you are looking for a specif part number, please include it with your message. E-BOX – Power Cable Box for Desk & TV & Computer | Cable Management | Hide All Electric Wires & Power Strips | High Quality Scratch Resistant Organizer to Cover Cords in Style!